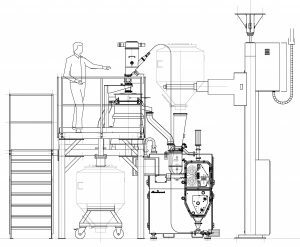 Automatic granulation unit with Alexanderwerk WP 200 Pharma incl. platform, vaccum conveyor systems, lifting column and automatic filling. Special engineered solutions and custom-made products as well as plant constructions complement the Alexanderwerk portfolio. For decades we have been offering individual and tailor-made solutions that are already responding to the special requirements of national and international companies in the development, construction and production of machines and plants. The possible combination of our own and sub-supplied components from a single source, represents the basis of our support in the plant construction. Our portfolio includes among others lifting & material handling technologies, conveying systems, platforms, screening machines and crushers. Alexanderwerk complies for the planning and execution of industrial equipment always with individual customer requirements and international standards. In order to fulfill the needs completely, we combine the sub-disciplines chemical engineering, mechanical engineering, electrical engineering and software development, which are supervised by an experienced Alexanderwerk project team.